Harold Oscar Teague was born on the 15th October 1877 in Victoria Park, Western Australia and brought up in the Church of England religion. His father’s name was John Henry Teague – who worked as a Commercial Agent, mother is unknown, and he had one sibling – a sister, named Laura Claris Teague. Supposedly his family lived in WA as this is his birth place, however records have shown that his family after his birth were located in Turramurra, NSW. This suggests that they may have moved to come closer to Victoria to where Harold went to school, even though they would have still been in a separate state. Harold attended Brighton Grammar School (BGS) between 1888 and 1894 in which time the school was led by Headmaster, Dr Henry Crowther. He enrolled in BGS aged only 10 years and 2 months as the 213th student. Harold had previously been home-schooled so BGS was a completely new experience for him however during his 6 proper schooling years, the 1917 Grammarian suggests that he attended another school – unknown, for 1 year during this period. However, he successfully persuaded his father to bring him back to BGS to finish his schooling. It is implied that because his family lived interstate, he was a boarder at BGS however other resources show that he may have lived in a house called Norwood in Brighton. Norwood was a notorious mansion which was destroyed many years after Harold supposedly lived there. During Harold’s time at BGS, he was involved in many school sports and co-curricular activities. In 1893, he played in the BGS First’s Football Team. The next year in 1894, he competed in the BGS annual athletics competition. In this, he completed the 1 mile walk and run as well as the 100 yard Siamese race. Harold (holding the footy – centre), alongside the BGS footy team, 1893. Harold finished at Brighton Grammar School in 1894 and by this stage, he had shown immense skill in medical practice and medicine. He enrolled into a Victorian University and began a medical course. He finished this course in 1902. After finishing his course, he moved back to his birth place – Victoria Park, WA. When he moved to Victoria Park, his parents supposedly moved with him as records show that he lived in their house in Victoria Park until he went off to war. Victoria Park is located to the South East of Perth and is a small inner city suburb. Harold Teague served in WW1 between 1914 and 1918 in many different regiments. Enlisting in Perth, Harold was a soon to be soldier or in his case, Captain, sailing off to Egypt. Leaving his country, the people he left behind were his sister and father. He had no wife and as such left as one of the very few single men. On the 5th of May, 1915, Harold enlisted in the Australian Imperial Forces (AIF) bound for World War 1 (WW1). After he enlisted, his medical talent was recognised and in the few short months he had left on Australian shores, he became the President for the Western Australia branch of the British Medical Association (BMA). HMAT A62 Wandilla, the ship Harold travelled to Egypt on. On the 25th of June, merely 2 months after he became President for the BMA, Harold sailed to Egypt upon the HMAT A62 Wandilla departing from Fremantle. Alongside the 1st Australian General Hospital Regiment, Harold sailed as a doctor aged 38. After the ship arrived in Egypt, Harold was made the Operations Commander (OC) at a hospital that was transformed from a former Luna Park (amusement park). The Luna Park was open for a short period of time, however when the war sprung up, the park was closed and transformed into a hospital and medical headquarters for the AIF. Located in Cairo (North Egypt), the location was chosen for two major reasons; One, it not only provided an easy route across the Mediterranean Sea to where the battle was happening, but two, it also provided an easily accessible place for troops coming from Australia. On the 16th Jan, 1916, Harold left Cairo and was transferred to the 2nd Field Ambulance Regiment as a Captain. During his time with the 2nd Field Ambulance Regiment, he was sent off to both France and Belgium to fulfil his duty on the Western Front. Just short of a year later, Harold was then assigned to the 11th Battalion as a Medical Officer. Not long later however, he became the Commanding Officer and was once again out working on the Western Front up-to his death on the 14th Feb, 1917. On the 14th Feb, 1917, Harold Oscar Teague was killed by opposing forces. As he was returning from his nightly inspection of his battalion’s trenches, he was hit with a direct shot from presumably a handheld gun. His battalion’s trenches were only accessible by night as during the day they were under intense enemy watch. His last day serving as the Commanding Officer for the 11th Battalion was ended in the blink of an eye. The news of Harold’s death was soon spread around and two significant figures, felt that the service of Harold should be known. Sir Douglas Haig was the first of these two men and independently, he mentioned Harold in one of his despatches (9.4.17) named ‘Gallant and Distinguished services’. 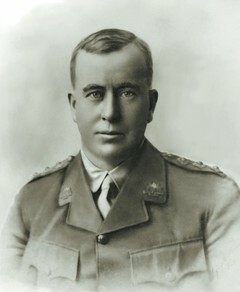 The second man was Major J.J Nicholas who wrote, “The division has lost the service of one of its best medical officers. Teague knew no fear.” Both men were outstanding characters and both very sorrowful at the loss of Harold. The news of his death was soon passed onto his father and sister back in Australia. After his death, his father received a pension of 40/ every fortnight while his sister received 77/6 fortnightly. Letters upon letters were exchanged between his family and the AIF each for a different purpose. One of the most valuable purposes however was in regards to his valuables and possessions left on the Western Front. Not too long later, these were gathered and the majority sent back to his family in AUS as they had requested. Today, Harold’s grave stands in Bazentin-le-Petit Military Cemetery, Bazentin, Picardie, France buried in plot 1 row G. This cemetery is a Military Cemetery and full of men from the Western Front and WW1. Together with the grave in France, Harold also has a plaque named after him which is located in Kings Park, Perth. All that is understood, is that the plaque was dedicated by a friend. NB: This research report was written by BGS student Martin Kulesza in 2016. All Year 9 History students write a report into the life of an Old Boy who died in WW1, including a Research Log and 66 character epitaph.